Johnson Elementary welcomed a prestigious guest this morning. 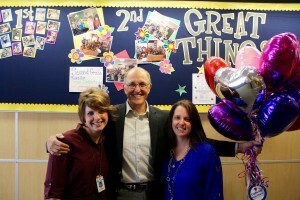 Flip Flippen, founder and chair of the Flippen Group, visited one of his company’s 11 Capturing Kids’ Hearts National Showcase Schools. 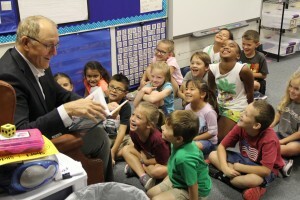 FUNNY READER – Flippen reads Johnson students a funny story. His visit to the school coincidentally coincided with International Literacy Day. Flippen estimated his organization goes on 500 school visits a week around the nation. Out of these schools, Johnson Elementary was chosen as one of the top 11 schools in the nation by the Flippen Group. When Flippen entered Johnson this morning, he walked by a banner profiling its Showcase Schools award from last year, but the banner also left plenty of room for awards in future years. It was clear to Flippen upon entering that the school doesn’t intend to slow down on implementing his education philosophies anytime soon. 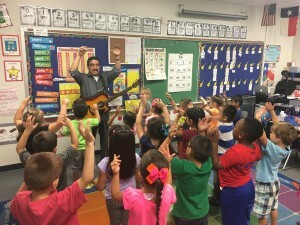 HANDS HELD HIGH – Flippen observed Jaime Mosqueda using music to teach Spanish to his bilingual class at Johnson. The appreciation went both ways. Amy Newbold, principal of Johnson Elementary, was thankful Flippen took the time to observe Johnson’s innovative learning styles. Newbold said winning the award served as an affirmation of all the hard work her staff put in to keep “a positive culture at Johnson. She said it has also provided talking points for students and parents. All of Johnson’s teachers and staff are trained according to Newbold and are using the procedures every day in their classrooms. She says that there is “100 percent buy-in” to the value of the program. Third-grade teacher Aubrey Rives agrees with Newbold’s assessment. It’s the relationships formed and a commitment to the Capturing Kids’ Hearts process, that Flippen believes is the reason for Johnson’s success. When asked what a school that wants to be a Showcase School should do, Flippen said they should start by stopping by Johnson Elementary to observe its process techniques in action. He went so far to say that Johnson Elementary is “among the best on the planet” at instituting the process of learning. Assistant Principal Amy Thomman said that Johnson’s success means they are embracing Bryan ISD’s vision of “Children First. Always.” She went on to say that Capturing Kids’ Hearts is here to stay at Johnson Elementary.